I made these for classes I used to teach at a Craft Store I worked at. 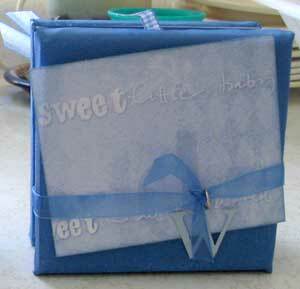 They can be used for any theme, are not expensive and you can use your scraps! The Covers are made from 4x4" canvas, painted and decorated. The accordion album is made from cardstock-a 12x12 page cut down 12x4 (then trim about 1/4" so it will not show from the outside, the canvases are not always exact size. I usually just go by how it looks when I put the paper to the canvas). I used Peel-n-Stick double sided sheets to attach the accordion album to the canvases. I decorated the accordion with cardstock, ink and embellishments before I attached them to the canvases, including punching all holes! The accordion album is decorated on both sides, you can display it open if you wanted. I used coordinating printed papers, inks, ribbons and rubber stamps for this. 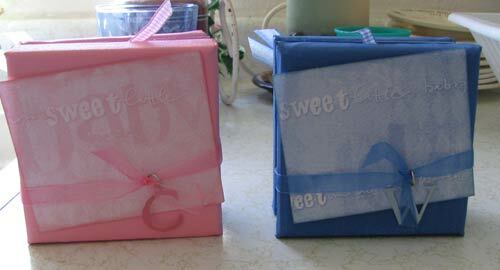 Front covers of mini albums embellished with cardstock, ribbon and alphabet charm. Thanks again Becki for your tips to make these great little mini albums. I have 30 or so 4x4 canvases waiting to be turned into something like this. If you would like to show us your baby mini albums then submit it here.